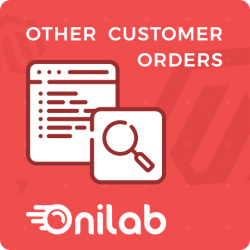 Onilab is a Magento development company working hard to integrate, optimize, upgrade, and fine-tune Magento for online stores from all over the world. Founded in 2011, we have transformed into a Magento Certified Developer Company with 50+ customer success stories. There are are still lots of must-have features that could make the life of Magento 2 merchants easier and better, especially for customer support. As a result, we decided to pitch in and put forth an extension to improve the experience of customer service representatives who are trying to help shoppers with their M2 orders. The result grew into Other Customer Orders (OCO), a free Magento 2 extension. This extension gives a concise overview of the customer’s order history with dates, order statuses, and price tags. Admins can quickly filter orders by date, status, or price to more rapidly access the relevant information that they’re looking for, while still seeing the big picture. Since customer support is a weak point for many organizations, we wanted to give Magento users an edge. We help to make the store owner’s life a little easier when they’re trying to work with difficult or disgruntled customers. rmation about one order at a time. Now, these reps can view additional relevant data on one page such as the customers’ order history information that can help to illuminate the customers’ relationship with the merchant. This information is valuable when you’re trying to make quick decisions. For instance, if an issue arises with a repeat customer, you may be willing to offer some sort of concessions, such as a coupon or free shipping, in order to satisfy the client. Magento 1 has a built-in order history view, but it’s not as prominent or optimized for quick lookup as we’d like. Moving to Magento 2.0, we made the decision to create a stand-alone extension to allow store operators to see all order history in one place, right where they need it. Our development team focused on providing a better overview of customer order history for Magento store admins. New features allowed admins to create an instant impression of what a customer’s order history looks like, how much money a shopper has spent in the past, and what kind of items they’ve been purchasing. Our “Other Customer Orders” went live on the Magento Marketplace in June of 2018, and is quickly gaining popularity with admins who need to talk to customers on the phone about an order, but at the same time want to see a holistic picture of the relationship with the person with whom they’re speaking. In your Magento 2 Admin Panel, navigate to Stores > Configuration > ONILAB EXTENSIONS > Other Customer Orders. 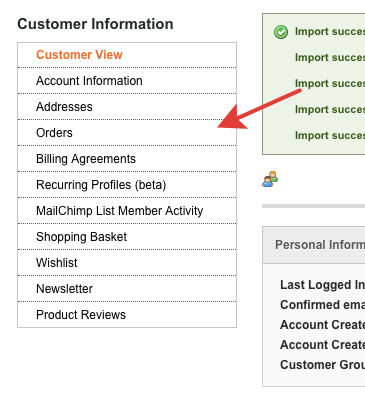 You’ll find settings to adjust to the way that you want to view order history data. Choose how you’d like to see the mini-grid displayed and the number of orders being displayed (we recommend starting with the latest 10 orders). Additional config tips are available in our installation guide.